Always a Free Shipping Option at Halloween Express! We have done the research and are offering links to excellent Egyptian coffins, coffin props, Halloween posters, fog machines, and Halloween decorations sold by our affiliate partners. Many of these partners carry excellent masks. Click images for more information. Happy Halloween. The first mummy prop is our very own coffin you can buy from us! Thank you for supporting our Halloween partners. 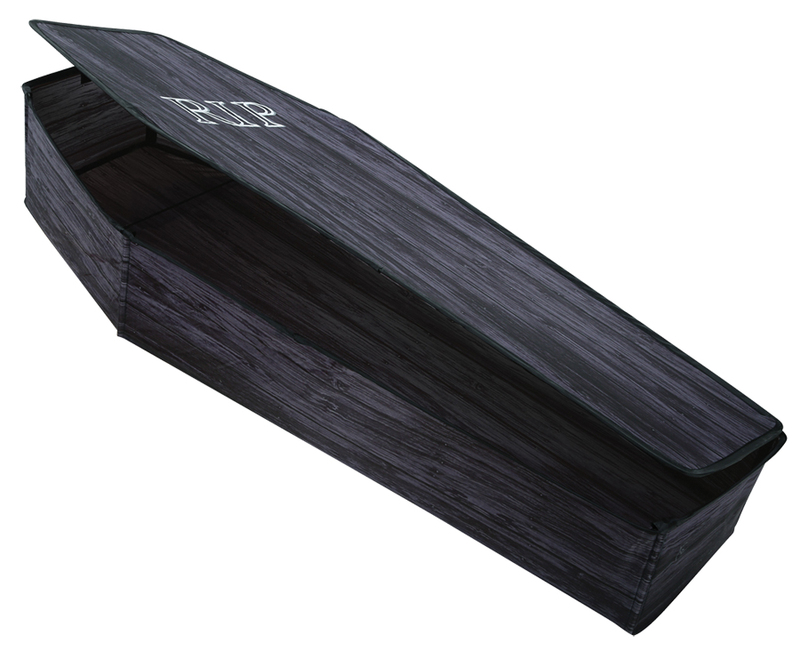 This wooden-looking coffin is new for this year, affordable, and easy to put together. Description: 60-inch (5 foot) life-size realistic-looking wood planking is printed on weather resistant nylon material. Black RIP screen-print graphic is on the lid. Flexible and bendable metal frame. 6 PVC support tubes are included to place into pockets at each of the 6 corners of the coffin to create and maintain the coffin shape. Includes bag with handles and zipper and has color paper packaging. This Egyptian coffin Halloween prop is perfect for any haunted house with an Egyptian theme or an Egyptian room. This prop is the front half of the Pharaoh's coffin, making it more affordable! It works well propped against a wall in a haunted house or home haunt. Please order and we will determine the best shipping cost for you. Or feel free to e-mail us your interest and we can calculate shipping before you buy. Click on the image to get information on this product. It comes from one of our partners. Every home haunter or haunted house owner needs a professional fog machine. Below are quality fog machines you can purchase from our partners. Click on the fog machines for more information or to order. Bubble machines continue to be popular at haunted houses, as well, and we recommend the bubble machine below. Mesh tombstone tent that covers your fog machine! I recieved my coffin yesterday thank you so much. I put it together -- wow -- so easy! I love it.